Mehron's Spirit Gum Remover is used throughout the Performance Industry because Performers recognise the safe effective formula of Mehron's Spirit Gum Remover will not damage the skin. 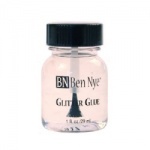 To remove Spirit Gum with Spirit Gum Remover apply remover to a cotton wool ball or similar. Only a small amount should be required. Dab over the required area or rub swab as close to the edge of the applied prosthetic (where the skin meets the prosthetic). Continue with clean swabs as required. Once the area of skin is free from Spirit Gum wash with soap and water and then apply a moisturiser as necessary. 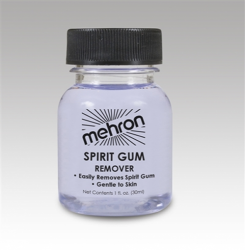 Click here for a Material Safety Data Sheet for Mehron Spirit Gum Remover.